26th November 2013 – Alicja Borkowska and Iris Papadatou from you&me architects have been announced as the UK winners of the first Old Doha Prize, an architectural competition to redesign part of the old city of Doha in Qatar. The winning team, which also included two local architects, was announced last night following a week long charette which saw promising young British architects and urban designers collaborate with their Qatari counterparts to reimagine the urban landscape of old Doha. The competition bought together four teams of architects who worked intensively to develop contextual design responses to address the challenge of regenerating and maintaining the heritage of the city. Both the British and Qatari participants explored Doha’s architectural history and the city’s ambitious plans for the future, sharing skills and their vision for heritage based architecture. As well as site visits to specific neighborhoods in Old Doha, including special access to key heritage buildings, participants also attended lectures, seminars and dinners with leading local academics, conservationists and planning experts. Together, the Qatari and British architects worked to produce designs to regenerate this piece of the old city centre in a vibrant and sustainable way, learning from the historic street pattern and buildings, whilst incorporating elements of contemporary Qatari design. The Old Doha Prize has been organised by the British Council and Qatar Museums Authority (QMA) as part of Qatar UK 2013 Year of Culture, in association with the Doha Architecture Centre, Msheireb Properties, the Royal Institute of British Architects (RIBA) and the Bartlett School of Architecture at University College London. The winners received a grant of £15,000 to allow the architects to further develop their research and ideas explored as part of the Old Doha Prize design residency. Winning Qatari participants will also be given the opportunity to visit the London Festival of Architecture in the UK in June 2014. Celebrating the long-standing relationship between the two countries, Qatar UK 2013 Year of Culture aims to forge new and support existing partnerships in the arts, education, sport and science sectors, while promoting awareness and appreciation of each country’s culture, achievements and heritage. The Year is coordinated by Qatar Museums Authority (QMA) and the British Council with the support of the Minister of Culture, Arts and Heritage and Katara Cultural Village along with Platinum Sponsors Qatargas, Qatar Shell and Vodafone Qatar. Five teams of UK architects have been shortlisted to take part in a competition to redesign part of the old city of Doha in Qatar. 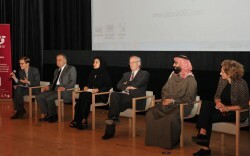 The competition, known as the Old Doha Prize, is part of the Qatar UK Year of Culture 2013. The Prize provides a unique opportunity for both UK and Qatari architects to develop creative ideas together, and contribute to the future shape of this dynamic Middle Eastern capital city. The five architect teams will take part in a week long design residency from 17 – 24 November 2013 in Old Doha where they will share skills and innovative concepts with their Qatari counterparts. They will explore the process of regeneration and potential for incorporating the heritage and history of the area into their designs at a time when billions of pounds are being invested to transform Old Doha. The winning team will be awarded the Old Doha Prize and a grant of £15,000, allowing the architects to further develop their research and ideas explored as part of the design residency. • Riccardo Bobisse of AR Urbanism. The Old Doha Prize is organised by the British Council, Qatar Museums Authority, in association with the Royal Institute for British Architects (RIBA), The Bartlett School of Architecture, UCL in the UK, and the Doha Architecture Centre and Msheireb Properties in Qatar. High profile industry specialists from these organisations were also part of the judging panel responsible for selecting the five teams. During the design residency in Doha, the teams will be asked to propose an intervention strategy to regenerate a piece of the old city centre. As part of their design response, the teams will be asked to reference the historic street pattern, whilst investigating appropriate elements of contemporary Qatari design. Teams will be assessed on the quality of their exploratory research and proposed design response. Old Doha is under-going significant regeneration and transformation, thanks to several powerful catalysts, including the construction of a new Metro, the Msheireb Project and the 2030 National Vision, making this an exciting time for British architects to be forging connections in Qatar. Msheireb Properties’ flagship regeneration project of the historical downtown of Doha, will alone see £3.65 billon in development invested in this area. A number of key British based companies including Arup and Allies and Morrison are already working on projects within the Msheireb Project, bringing their experience of working on world class regeneration projects such as the London 2012 Olympic Park to Qatar. These architectural developments in Old Doha aspire to balance regeneration and development to ensure the history of the area is celebrated and maintained. Qatar has the fastest growing and most stable economy in the Middle East and is using its financial strength to promote social development. Its population has doubled in the last four years and is predicted to double again by 2015. Through its National Vision for 2030, Qatar aims to be an advanced society capable of sustaining its development and providing a high standard of living for all of its people; incorporating long-term strategies for economic, social, human and environmental development. The Old Doha Prize hopes to encourage long lasting ties between British and Qatari architects and designers that will increase the skills of professionals in both countries. Qatar UK 2013 is a year-long cultural exchange programme between the United Kingdom and the State of Qatar, aiming to strengthen bilateral relations by creating lasting partnerships between institutions and individuals. Mutual recognition, understanding and appreciation of Qatari and British cultures are cultivated through over 60 entertaining and educational events throughout the year in both nations. Qatar UK 2013 is coordinated by the British Council and Qatar Museums Authority (QMA) with the support of Platinum Sponsors Qatargas, Shell and Vodafone. Applicants, which included students, emerging and interdisciplinary collaborators, as well as more established practices had to have at least two years’ experience and submit up to five examples of key projects representing their approaches. These were then assessed by the judging panel using a grading framework which took into account the applicant’s response to the subject of cultural heritage and contemporary design; how they might benefit from taking part in the programme; what they could offer to their team in the way of experience and knowledge; how well their ideas were presented; and the relevance of their previous work. Submissions from a variety of specialisms, including public realm and urban design, heritage and restoration were received and this diversity is reflected in the selection of successful participants. Riccardo Bobisse is an urbanist and Associate at AR Urbanism, with a diverse background enabling him to thrive in projects involving visioning, strategies and delivery plans within complex cultural and built form settings. AR Urbanism are a specialist master planning and urban design studio working on a range of urban regeneration and public realm projects. The practice has ‘positive place-making’ embedded in its approach to design as well as a focus on collaboration with architects and other consultants to produce healthy town centres and liveable neighbourhoods. Peter Barry is a London based architectural consultant and designer with national and international experience. Prior to setting up his UK design practice, studio p, he spent 8 months in East Africa where he consulted on restoration projects in Zanzibar and the Comoro Islands, developing a strong interest in Islamic heritage. His current projects include a contemporary residence in Aldeburgh, Suffolk and the restoration of a nineteenth-century sultan’s palace in the Comoro Islands. Calvin Chua and Georgios Eftaxiopoulos are architects and urbanists trained at the Architectural Association. Questioning and rethinking architecture within contemporary living culture and urbanity, they have won several awards for their projects, including the Wilmotte Foundation Prix W. In addition, they are active in the research and academic field through contributing articles to architectural journals, conducting workshops and teaching at various schools, including the Architectural Association, The Berlage – TU Delft and Istanbul Bilgi University. Harry Dobbs and Rohilio Escarga are from Harry Dobbs Design, an award winning RIBA Chartered Architects and Urban Design practice based in London. Informed by a uniquely integrated approach to urban design, architecture, landscaping, lighting and product design, the practice’s work has been recognised internationally for its innovative and culturally responsive approach to urban regeneration. Alicja Borkowska and Iris Papadatou are two architects/designers with a strong interest in the public realm and how people shape places. They established the emerging multi-disciplinary architecture platform you&me after studying together at Cambridge and the Royal College of Art. you&me is committed to making things – a postcard, a book, an installation, a building – using playful, challenging and inclusive methodologies. The platform places great emphasis on collaboration, the process, the way we all work with each other and everyone involved in any one project. you&me believe that even the smallest interventions can have a big impact and self-initiation and continuous community participation is fundamental to their approach. You&me: you and us. The British Council creates international opportunities for the people of the UK and other countries and builds trust between them worldwide. We are a Royal Charter charity, established as the UK’s international organisation for educational opportunities and cultural relations. We work in more than 100 countries, and our 7000 staff – including 2000 teachers – work with thousands of professionals and policy makers and millions of young people every year through English, arts, education and society programmes. Within Architecture, Design and Fashion we develop exhibitions, exchanges, events, workshops, installations and specialist visits in conjunction with our colleagues and partners to create links and connections between designers and cultural institutions around the world. Recent projects include the British Pavilion at the Venice Architecture Biennale, Everything Forever Now, Atlas of the Unbuilt World, 1:1 Architecture Dialogues. Qatar Museums Authority connects the museums, cultural institutions and heritage sites in Qatar and creates the conditions for them to thrive and flourish. It centralizes resources and provides a comprehensive organization for the development of museums and cultural projects, with a long term ambition of creating a strong and sustainable cultural infrastructure for Qatar. Under the patronage of His Highness the Emir, Sheikh Tamim bin Hamid Al-Thani, and led by its Chairperson, Her Excellency Sheikha Al Mayassa bint Hamad bin Khalifa Al Thani, QMA is consolidating Qatar’s efforts to become a vibrant center for the arts, culture and education, in the Middle East and beyond. Since its foundation in 2005, QMA has overseen the development of the Museum of Islamic Art (MIA) and Mathaf: Arab Museum of Modern Art. Future projects include the Al Zubarah World Heritage Site Visitor Centre opening in 2013 and the launch of the highly anticipated National Museum of Qatar in 2016. QMA is committed to instigating Qatar’s future generation of arts, heritage and museum professionals. At its core is a commitment to nurturing artistic talent, creating opportunities and developing the skills to service Qatar’s emerging art economy . By means of a multi-faceted program and public art initiatives, QMA seeks to push the boundaries of the traditional museum model, and create cultural experiences that spill out onto the streets and seek to involve the widest possible audiences. Through a strong emphasis on originating art and culture from within and fostering a spirit of national participation, QMA is helping Qatar find its own distinctive voice in today’s global cultural debates. The Royal Institute of British Architects (RIBA) champions better buildings, communities and the environment through architecture and our members. The Bartlett School of Architecture was established at University College London in 1841 and is now one of the world’s most exciting architecture schools. Its name stands for provocative ideas, boundary-pushing research and high-achieving lecturers and students. Well known for its rigorous, innovative and experimental approach to architecture, the School attracts staff and students worldwide. Alumni of the School include the directors, partners and founders of some of the most successful architecture practices in the world today, as well as artists, filmmakers, historians, writers, policy-makers, journalists and politicians. As part of The Bartlett, UCL’s global Faculty of the Built Environment, The Bartlett School of Architecture offers a vibrant centre of exchange for the built environment, acting as an academic, cultural and professional hub where leading research is announced and discussed, lively debates are hosted and encouraged, and innumerable exhibitions, conferences, public talks, screenings and other events all take place. Msheireb Properties’ mission is to change the way people think about urban living and improve their overall quality of life, through innovations that encourage social interaction, respect for culture, and greater care for the environment. Msheireb Properties spent three years researching Qatari architecture and numerous approaches to urban planning all over the world with the most respected experts in the industry – in order to realise an architectural language rooted in the best of the past that may be preserved for and by future generations. The company’s name, Msheireb, means ‘a place to drink water’ and is the historical name of the downtown area of Doha. The company’s corporate identity depicts the mouth of a stone well, a feature of traditional Gulf societies, and its distinct ink effect evokes classical Arabic calligraphy. Msheireb Properties recently achieved ISO certification from the British Standards Institution for quality (ISO 9001:2008), environmental performance (ISO 14001:2004), and occupational health and safety (BS OHSAS 18001:2007). The company has also earned widespread industry recognition, including at the MIPIM Architectural Review Future Projects Awards in Cannes, France. The Old Doha Prize is organised in association with the Royal Institute for British Architects (RIBA) and The Bartlett School of Architecture, UCL in the UK, as well as the Doha Architecture Centre and Msheireb Properties in Qatar. The Prize offers UK architects the unique opportunity to collaborate with their Qatari counterparts; five teams will research and explore new ways to address the changing urban landscape of Old Doha. They will share approaches, skills and creative ideas to explore the process of regeneration and potential for incorporating the heritage and history of the area into their designs. 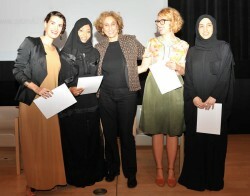 The winning team will be awarded the Old Doha Prize and a grant of £15,000. The grant will provide the team with the opportunity and resource to implement ideas explored as part of the design residency. This might include the implementation of the project in the form of an exhibition, research project, publication, installation, public intervention or film. The Old Doha Prize will encourage architects to develop compelling and contemporary ideas in response to Doha’s historic city centre. The brief will focus specifically on the neighbourhoods of Al Asmakh and Najada in the heart of Old Doha, and will be founded on the principle of ‘Living Heritage’. This is the idea that heritage is not something set in history; rather something that continually evolves whilst remaining deeply rooted in the past. The ‘Old Doha Prize’ is open to architects with more than two years’ experience. Applicants must have the full support and endorsement of their architecture practice. 1. Up to five examples of key projects (realised or speculative) that you feel represent your approach. 2. CV of the architect(s) attending. Submissions should be in PDF format and not to exceed 2MB in size. These should be emailed to QatarUK2013_UK@britishcouncil.org by 4pm (GMT) on Thursday 30 August 2013 in the UK and 4pm (GMT) on Sunday 15 September 2013 in Qatar. Old Doha is under-going significant regeneration and transformation, thanks to several powerful catalysts, including the construction of a new Metro, the Msheireb Project and the World Cup in 2022, making this an exciting time for British architects to be forging connections in Qatar. Msheireb Properties’ flagship regeneration project of the historical downtown of Doha, will alone see £3.65 billon in development invested in this area. Architectural developments in Old Doha aspire to balance regeneration and development to ensure the history of the area is celebrated and maintained. A number of key British based companies including Arup and Allies and Morrison are already working on projects within the Msheireb Project, bringing their experience of working on world class regeneration projects such as the London 2012 Olympic Park to Qatar. November 25, 2013 in Awards.